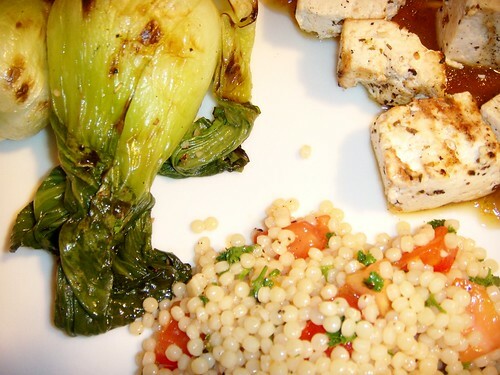 grilled tofu with sweet chili garlic sauce, braised baby bok choy, and mediterranean couscous, originally uploaded by aarn! +9th January, 2009+. half submerged bok choy in sauté pan with vegetable stock, chopped garlic, chopped ginger, a splash of soy sauce, salt, and pepper, covered and simmered for 15-minutes, then grilled for a little color and flavor. quickly marinated blocks of tofu in crushed garlic, lemon juice, red wine vinegar, fresh chopped oregano, a little olive oil, salt, and pepper. then grilled on high heat on an oiled grill until colored and crisp on the outside. served over the sweet chili and garlic sauce from a previous entry. cooked the couscous in 1:1.25 ratio of cous to water, adding a little white balsamic vinegar, olive oil, crushed garlic, local dark farm honey, salt, fresh cracked pepper, a little stock from the bok choy, fresh tomato, and parsley.